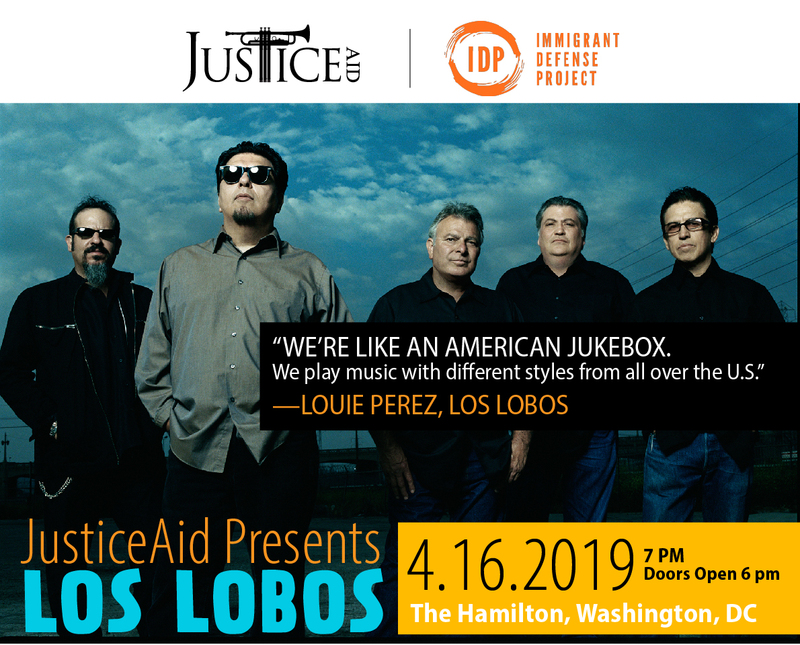 The legendary rock band will be performing at this year’s #JusticeAidConcert—a music benefit for the Immigrant Defense Project to be held on Tuesday, April 16th, at The Hamilton in Washington, DC. Act Now Before Tickets Are Gone. Click below to purchase tickets and sponsorships. We are proud and honored to be part of this event to bring awareness to the issues that affect so many immigrants and people living in the U.S.
Hailing from East LA, Los Lobos has recorded over two dozen albums as well as music for numerous movie projects since their debut in 1973. The band is known for its unique blend of rock, folk, jazz, Tex/Mex, R&B, and traditional music—embracing and reflecting the musicians’ Latino/ Mexican immigrant roots and in a voice that is quintessentially American. The thread that runs through our music is our own culture. We are an American band in the purest definition because America is made of so many different things. With hits ranging from Will the Wolf Survive and One Time One Night to their #1 recording of Ritchie Valen’s La Bamba, Los Lobos is a band that continually reboots itself and expands its scope with each passing year, while never losing sight of where they came from. Working at the intersection of racially biased U.S. criminal and immigration systems, the Immigrant Defense Project (IDP) is making major strides in securing fairness and justice for immigrants in the United States. JusticeAid is excited to help, and we appreciate your support. Check out Louie Perez’s new musical memoir: Good Morning, Aztlan. Buy through Amazon Smile and designate “JusticeAid” as your charity of choice!